Inspiring, encouraging, and accessible, this is the book every career woman needs. Millions of women are trying to climb the corporate ladder but many lack the courage or confidence to get from one rung to the next. 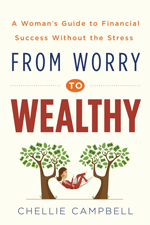 Personal finance guru Chellie Campbell offers an engaging, empowering guide for women to reduce financial stress and maximize wealth and success at any stage of their careers. Using proven strategies from her popular Financial Stress Reduction workshops, Chellie teaches readers how to watch out for common pitfalls, including “The Attitude That Will Kill Your Business-‘I Can Do It Myself,'” and harness the strengths they need to drive their careers forward.